Draindown Basket - Gilson Co. The HM-56 Draindown Basket for uncompacted bituminous mixes effectively measures the amount of asphalt binder that separates from a sample held at elevated temperatures during production, transport and placement. The test is ideal for Stone Matrix Asphalt (SMA) or open-graded porous asphalt mixtures. A sample is placed in this basket and draindown is measured as that portion of binder that separates from the sample and is deposited onto a disposable paper plate under the basket. Paper plates can be obtained locally. 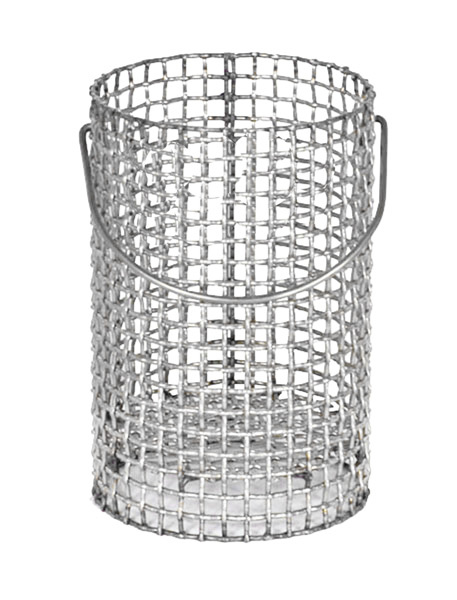 Basket is constructed of quality ASTM E11 stainless steel mesh and has a 1in (25mm) bottom skirt with convenient bail-type handle.